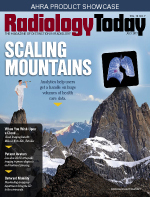 Low-dose 2D/3D orthopedic imaging improves diagnosis and treatment planning. As it has in other specialties, technology is changing orthopedic imaging for spine, hip, and knee for the better. Lower-dose X-ray technology is making it safer, especially for children who undergo repeated exams for scoliosis or other musculoskeletal conditions. The ability to capture full body images without stitching or vertical distortion provides true-size images that physicians can use for more accurate measurements and surgical planning for such procedures as spine surgery or hip and knee replacements. The ability to provide weight-bearing images in three dimensions is also rapidly being accepted as a necessity, particularly when addressing patients with complex 3D deformities. EOS Imaging, based in Paris, offers these features on its EOS 2D/3D imaging system, which it is authorized to market in 51 countries, including the United States, Japan, China, and the European Union. The EOS X-ray machine is based on Georges Charpak's 1992 Nobel Prize-winning invention in physics in the field of particle detection. The company invented its scanner at the request of many orthopedic surgeons who wanted to image patients in 3D and in a weight-bearing position without excessive irradiation, says Marie Meynadier, PhD, CEO of EOS Imaging. The 3D modeling for the spine was available from day one, she says. In 2012, EOS was able to add 3D modeling for the hip and knee. In July 2016, EOS announced an exclusive partnership and licensing agreement for virtual patient models with Anatoscope of Montpellier, France. The partnership allows the companies to combine Anatoscope's virtual patient models with EOS 2D/3D images and data sets to create a realistic and informative way to analyze each patient's unique anatomy. The new capabilities were incorporated this year. Meynadier says that introducing virtual patient models into EOS' advanced 3D orthopedic applications will assist surgeons as they plan their patient's orthopedic treatments. "Once you have a 3D image with anatomical data embedded, there are all kinds of things you can do," she says. Meynadier expects virtual patient models to benefit not only complex spine conditions and 3D-based hip and knee surgery but also clinical education. The Spine and Scoliosis Center at Nemours Children's Health System in Wilmington, Delaware, acquired its EOS 2D/3D Imaging System in 2012, soon after it became commercially available. Nemours Children's Health System now has three units: Nemours Children's Hospital in Orlando, Florida; Nemours Children's Specialty Care in Jacksonville, Florida; and Nemours/Alfred I. duPont Hospital for Children in Wilmington, Delaware. "Scoliosis is a 3D deformity that we've just never been able to see with conventional X-rays properly, and CT involves much more radiation," says Suken A. Shah, MD, division chief of the Spine and Scoliosis Center at Nemours/Alfred I. duPont Hospital for Children. In addition, he says, the patient is lying down during a CT scan, which may partially correct their curve and make it more difficult to evaluate. With the EOS system, surgeons get 3D views of their patients' spine in a weight-bearing position, a circumstance that is critical for correctly evaluating scoliosis. "This has really opened our eyes about the nature of the deformity and how to best correct it," Shah says. "It will be a critical part of the new classification system of adolescent idiopathic scoliosis that we are working on." The EOS machine has two pairs of perpendicularly positioned radiation sources and detectors that allow the frontal and lateral planes to be captured simultaneously. Thanks to the biplanar acquisition, the 2D images can be used to generate 3D models of a patient's skeleton. The 3D reconstruction is helpful for scoliosis patients, Shah says. "The simultaneous two planes are a lot better than what you would have from separate frontal and lateral X-rays, which is the traditional way. When you have only two planes projected, you miss a lot in the torsion mechanics," he says. 3D provides a better understanding of the effect of torsion. "And you can really appreciate what's happening in each region of the spine prior to surgery," he says. There are additional benefits for scoliosis patients, many of whom have to undergo frequent imaging, Shah says. Scoliosis patients are likely to have spine images taken every four to six months until their skeleton has reached full height. The EOS X-ray Imaging System is always low dose but offers a Micro Dose protocol for pediatric follow-up exams. It's known that radiation exposure from medical imaging may result in long-term risks to patients. Children, in particular, are known to have an increased risk of developing radiation-induced cancer later in life, Meynadier says. A 2016 study in the European Spine Journal found that women with scoliosis who underwent frequent X-ray imaging at a young age have an overall cancer rate five times higher than the age-matched control population 25 years posttreatment. EOS Imaging's Micro Dose option reduces the radiation from a pediatric follow-up spine exam to only a week's worth of natural radiation on earth, Meynadier says. Shah adds that the system can be used to measure whether a treatment is working by comparing curves over time: "We can see how well the curve was corrected in all three dimensions." He says this ability will be critical in evaluating innovative therapies and improving outcomes. Shah uses 3D modeling in some cases for patients with moderate curves who are likely to progress, as a way of evaluating whether a brace could be effective, or with mildly affected patients. "We request 3D images on those patients to see how well they are corrected by a brace," he says. "It's been an effective way to determine whether noninvasive treatments are an option." Nemours also recently acquired the EOS Radiolucent Chair, which allows the center to expand the use of the EOS to additional patients. "It's helpful to image nonambulatory patients in their natural seated position," Shah says. "We are still able to see all of the anatomical landmarks and even create the 3D models for these patients who were not able to benefit from this low-dose technology before." Leslie Grissom, MD, pediatric radiologist at Nemours and a clinical professor of radiology and pediatrics at the Sidney Kimmel Medical College at Thomas Jefferson University in Philadelphia, notes that the detail on the scans from the Micro Dose EOS is not as good as standard EOS low-dose images and conventional radiographs. It's worth the sacrifice, however, because "We take a lot of films through the adolescent period. That's a lot of radiation, especially if you're doing two views each time," Grissom says. "It's so important to use as little radiation as possible because over the long term that radiation can add up." EOS is a digital technology that also cuts down on the scatter, Grissom adds. "You don't get scatter because the EOS uses a fan beam. The scatter is not collected. That's really a benefit for larger patients," she says. EOS captures full body images in a single scan without stitching or vertical distortion. "This provides true-size images on a 1:1 scale for accurate measurements and surgical planning," Meynadier says. Interpreting the scans from the EOS machine is not much different from traditional scans, Grissom says, but there is a learning curve. "Because it has a digital sensor, if a patient moves you get a wavy appearance instead of a blur, as you would with conventional radiographs or photography," she explains. "Once you learn about this, you're fine. But if you don't know about it, you could misinterpret the scans because you see some curving." Grissom recalls reading a lower-extremity study that included proximal femurs that looked bowed. "It turned out the patient moved, and that's why they were bowed," she says. Patients have to be able to hold still during the scan, she notes. The exposure is only about 12 seconds, but, for some pediatric patients, that could be too long. Grissom says for most it is not prohibitively lengthy, though, even very young patients. Nemours' EOS imaging system is in its orthopedics department, not radiology. The scans are pushed to their PACS. "We don't read them in real time," Grissom says. "We might end up reading them within a few hours or later that day." However, she says, the throughput is pretty quick. "It's just a matter of minutes once the patient is in the gown." The pediatric patients and their families appreciate that it's not long, she says. The 3D images are not created on the radiologists' PACS, Grissom adds. "They're done on the sterEOS workstation that comes with the EOS system. If we want to see them, they are easily available to us." The EOS 2D/3D Imaging System also plays a role in imaging adult patients suffering from degenerative or deformative spine conditions. About 400,000 patients undergo a spine fusion surgery every year in the United States. The system allows the technologist to access pelvic and vertebral data in a standing position. From this data, surgeons can assess their patient's alignment and precisely plan spine and other surgeries with real-time feedback on how changes to the plan affect the patient's key clinical parameters. The customized planning report can be accessed in the operating room, Meynadier says. Complex spine deformities as well as reconstruction surgeries require correction across three planes of the body, Meynadier says. She adds that the 3D modeling also provides more accurate measurements of several key parameters that are used to evaluate lower limb alignment. These include the tibial and femoral length, frontal and lateral knee angulations, as well as rotations of the hip and knee joints—key measurements for total knee and total hip arthroplasties. "EOS 3D models provide a more complete picture of the patient's anatomy to help plan complicated surgical treatments," Meynadier says. The 3D images and data can be 3D printed to create models that allow orthopedic surgeons to better plan individualized treatments for their patients, Meynadier says. "Our EOSapps (3D surgical planning solutions for the spine, hip, and knee) allow the physicians to select the correct implant size and determine how those components should best be placed in the patient's anatomy," she says. Having this information before the patient gets to the operating room can save time in what can be very complex procedures, she adds. In the United States, most of EOS's installations were in spine hospitals, Meynadier says. "But we are growing in the United States and in Europe and the spectrum of hospitals that are using EOS is diversifying." She estimates that it's now being used fairly equally for spine, hip, and knee procedures. "Rather than just putting flat projected images in front of the referring physician, you bring both 2D and 3D images with the capacity to easily and accurately calculate the clinical parameters he/she needs," Meynadier says. She also expects that the 3D models made from the scans and 3D printing will show up in classrooms as tools for teaching new physicians.